Kansas City will most likely go into the season with three halfbacks, and with Spencer Ware and Kareem Hunt locked in that leaves West and Spiller fighting for one roster spot. 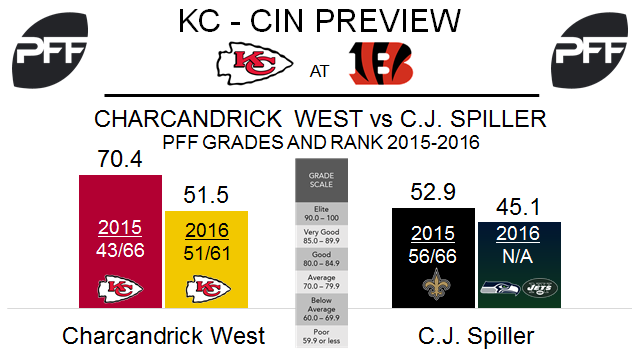 West showed some potential in 2015, playing 590 snaps and ranking 43rd at halfback with a PFF grade of 70.4. His production fell off last year, playing 368 snaps and recording a 51.5 PFF grade that was 51st out of 61 qualifying halfbacks. Spiller, now 30 years old, is trying to resurrect his career with the Chiefs. He only played 56 snaps last season in brief stints with the Seahawks and Jets. Spiller was once one of the most explosive running backs in the NFL, ranking first in PFF’s elusive rating in 2012 (measures a runner’s success beyond the point of being helped by his blockers) after forcing 66 missed tackles. Bryan Witzmann, G – With Parker Ehinger still on the PUP list, Witzmann has taken over the starting left guard position ahead of last year’s starter Zach Fulton. He allowed one QB hit in 14 pass block snaps last week, and finished with an overall PFF grade of 46.3, 81st out of 110 qualifying guards. Jarvis Jenkins, DE – Jenkins is facing an uphill battle to make the Chiefs 53-man roster, but he got off to a good start with the fifth highest grade of any interior defender last week at 86.6. Jenkins made two stops (plays graded as a “loss” for the offense) in 15 snaps against the run, a 13.3% run stop percentage that was the highest of the week among 3-4 defensive ends. 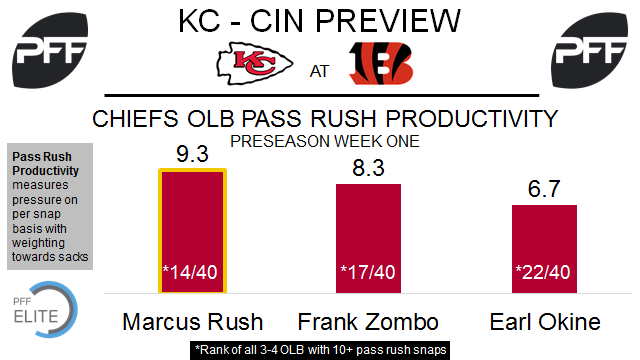 Marcus Rush, OLB – The Kansas City coaching staff took a long look at Rush last week as he played the most snaps of any Chiefs player with 69. Rush had one sack and three total pressures in 27 pass rush attempts, and a 9.3 pass rush productivity rating that was 14th out of 40 3-4 outside linebackers last week with 10+ pass rush snaps. 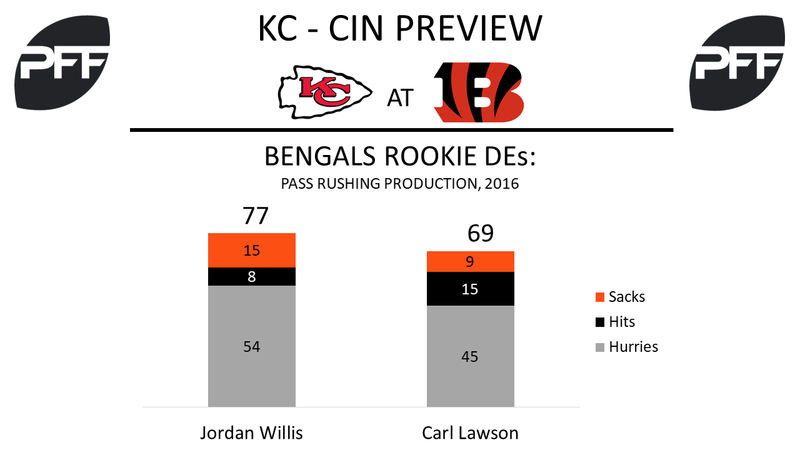 The newest members of the Bengals’ edge rushing corps all flashed impressive pass-rushing ability last week against the Tampa Bay Buccaneers. Smith led the way with two hits and five hurries, helping him earn the second-highest PFF overall grade of any player in the NFL last week at 91.0, the highest among edge defenders. That overshadowed a solid performance by Willis, who had a sack and hit of his own. The rookie third-round pick was the highest graded edge defender in the FBS in 2016 with a 94.3 overall grade. In college, Lawson averaged a QB pressure on every 5.4 pass-rushing snaps, and he continued that impressive rate in his debut against the Buccaneers with two hurries on 11 pass rushes. Jake Fisher, RT – Fisher has struggled in limited action early in his career, earning just a 47.8 overall grade last season on 296 snaps, but he started at right tackle last week and put together a good performance that he can build off of. He didn’t allow any pressures on 13 pass-blocking snaps and held his own in the running game. Demetrious Cox, FS – Cox emerged out of nowhere last week with a big interception of Ryan Fitzpatrick, and the undrafted rookie free agent safety wasn’t directly targeted on 19 snaps in coverage. He also came down and made a stop in run defense and put together an all-around solid showing. 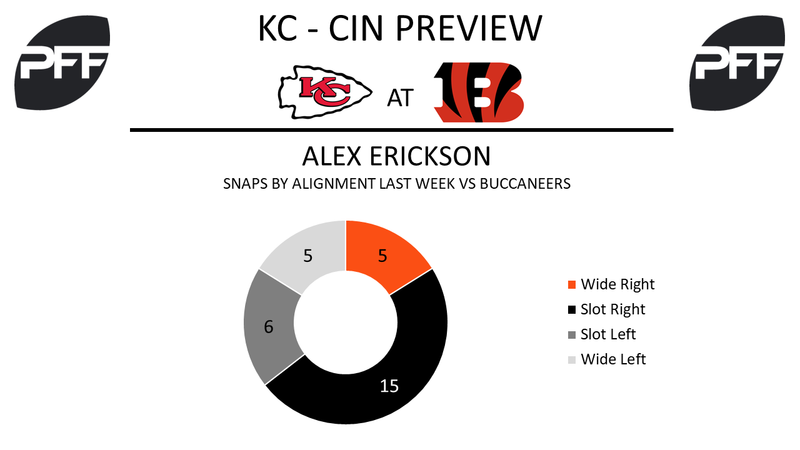 Alex Erickson, WR – The Bengals’ return man from last year started to show some nice moves as a receiver last week, leading the team with four targets, three catches and 50 yards, including 28 yards after the catch. Erickson also blocked well in the running game, and he was the team’s second-highest graded wide receiver in the game behind A.J. Green.